I asked a question on the [Time-Nuts] (Ref 1) mailing list about using a video distribution amplifier for frequency reference distribution, and did I get lots of good advice in response! So, I went and bought an Extron ADA 3 80 (Ref 2) distribution amplifiers from eBay and there are good news. The box is very sturdy, if not very RF proof, and all the electronics of the unit itself fits on a PWB that is mounted along the rear panel, the rest of the box (about 85% of it) is EMPTY, with many mounting studs on the top and bottom panels, a hacker's dream. The box has plenty of room for a GPS receiver, an HP 10811 OCXO, a microprocessor board and a display, if you see where I am going. Of course, the original wall-wart will not power the new guts, but a cheap laptop type switcher from All Electronics (Ref 3) will do the job nicely for few $. I need an 18 or 20V unit, then I will put a small switching step down regulator for the GPS receiver, it would be wasteful to use a linear regulator to step from 18-20V down to 5V at 300-400 mA (I have used the LT1375HV for that in many projects). Since I hate making enclosures from scratch for my projects (the least fun part in my opinion), this one will be well taken care of. 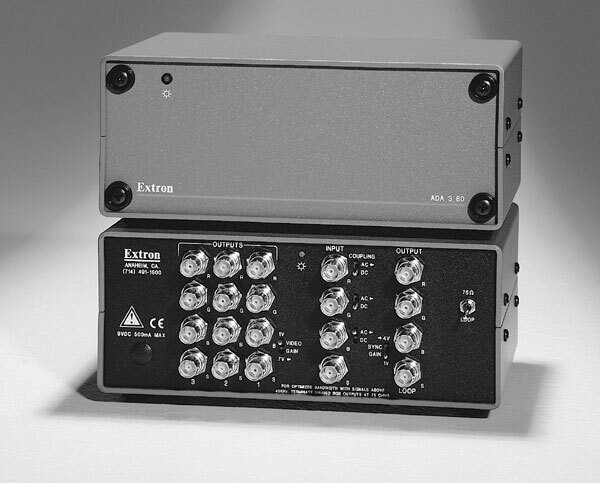 If you are interested in using this amplifier, here is some more info than is available on the Extron web site. The Extron 3 80 has 4 inputs (R, G, B and SYNC) and each drives 3 normal outputs and a LOOP output. The R-G-B channels are analog and the SYNC input drives TTL gates, and even though it seems to respond well to 1V p-p at 10 MHz, depending on your application, it may or may not be suitable for time or frequency distribution. Each input has a corresponding LOOP output, which is simply in parallel with the input, for looping through another device. You could use the LOOP outputs to loop a single 10 MHz signal through all 3 inputs and have 9 outputs right off with no modification (just put the switch to LOOP and put a termination on the last LOOP output to terminate the line) and low skew. I need at least 5 outputs at the moment, so 9 will suffice for a while for my purpose. Also, I only need it for frequency reference, not for timing, so delay is not a big concern to me at the moment (when I graduate to full-fledged [time-nut], this may change :-) It would not be too hard to modify the unit internally for one input and 16 outputs all in sync (give or take a nS or two), and 3 spare connectors. The delay between each input and any of the corresponding outputs is about 10-11 nS (measured with a sine wave input from my HP 8657B on a TDS210 60 MHz scope, I will use the HP 5334B for more accurate reading later.) The delay between each input and the corresponding LOOP output is 1-2 nS. There is a switch labeled 75 ohm/LOOP which simply makes the R-G-B inputs high-Z in the LOOP mode, 75 ohms otherwise. There is another switch that adjusts the gain of the R-G-B channels to 1:1 or 1:0.7. In addition, each analog channel has an adjustment potentiometer inside that allows to adjust the gain from 0-120% of rated (assuming 50 ohm loads on the outputs). On my unit, each R-G-B channel also has an internal jumper, I believe it is used to select AC or DC coupling. Newer models (such as the one in the picture above) have a switch on the rear panel for each input instead of an internal jumper for the same function. The wall wart is a 9VDC unit, the amplifier has an internal negative voltage generator and two regulators to drive the video amplifiers which operate from +/- 5V. I do not have the schematic, and it will be hard to pull because of all the connectors that clutter the PWB. If anyone has the schematic, that would be appreciated. Note that the PWB is common with another unit that has 6 outputs (and no LOOP output) for each input, the PWB is differently populated. I guess either schematic would do. The video amps are labeled 687J and do not have identifiable manufacturer label. I could not find a link to a spec sheet. There also, any help would be appreciated. Modifying the unit for isolated outputs (for use as a frequency standard distribution amplifier) seems possible. That would require replacing the BNC connectors with plastic shell types of the same model (available from Mouser, Digikey and others) and installing ethernet isolation transformers in line by cutting the traces on the PWB. The ethernet transformer modules have typically 2 to 4 1:1 isolation transformers in one package that work very well from 10 to 100 MHz and don't saturate with levels around 1V RMS.